A client of mine recently shared these words with me and they have stayed with and took hold within me. The ‘splinter in our soul’ represents our deepest wounding. If not removed and healed devastating effects such as shame and negative self-worth or deep-seated rage and distrust towards the outside world can result. Many people unconsciously live out their entire lives from the place of their deep wound and continue hurting themselves and wounding others as a way of releasing the internal pain created by the infested splinter. If not removed and allowed to heal, we remain stuck in that primitive state of development that’s inappropriate, ineffective and very very painful. You can sense the splinters pain when the mean voice in your head reminds you that we must prove your worth to a critical and unsafe world. Removing the splinter and healing the wound can be quite a painful process as it requires of us to forgive, surrender, trust and embrace that which we originally hurt us—that is, LIFE itself. It makes no rational sense. Removing the splinter takes intention, energy, focus and must be done with great care and grace. Remember, the game Operation? It’s no wonder people choose, however unconsciously, to avoid it by either denying its existence by numbing the pain through addictions, or more commonly living life out of their heads rather than their hearts and avoiding their internal processes altogether, and, finally, just as painful they purge that deep-seated pain onto the world as we see reflected in our country today with the increase in separateness and increased focus on differences rather than a coming together in shared healing. 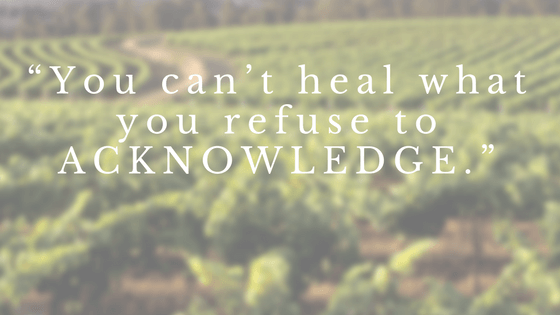 We begin to heal the wound by realizing and recognizing how we continue to be impacted by it. Awareness is always the path to deeper understanding and deeper healing. “You can’t heal what you refuse to acknowledge.” We remove the splinter and the blood surrenders within us the belief that our worth is defined by our experiences, that our value is reflected by how others treat us or that we have the power and control to change either of those two things. Each of us has the same inherent value and that value is unmeasurable, undefinable and unexplainable! When removing the splinter, we are invited to surrender, to bleed out, our wish or belief that anything could have been any different. This can be a very difficult and scary thing to do as the splinter cut so very deep that it can feel as though it is the very definition of our existence and we are the container for its identity. People do all kinds of desperate things in effort to continue holding onto the belief that they can, in some way, make the past different (if only in their own minds), rather than surrender the belief that they have some super power to make things different and believe the lie that they have control. The shocking effect, the impact made by the splinter can seemingly convince us that others had power over us (who we believed ourselves to be), so then we also believed the lie that, we too, must also possess the power over others. This is part of our original ‘sin.’ It is not the truth. Blaming or having perfectionistic expectations of ourselves and others is the ‘real life’ evidence of our wound’s inflammatory effects. If the splinter remains, scar tissue begin to surround it, protecting it and preserving it, thus making it all the more difficult to believe you could live without it, that you could live without the lie. The lie is the truth. But the irritation continues, nonetheless, festering, constantly reminding us of its presence as we feel and sense the pain as we move through our lives. The gift of the splinter is the space it leaves behind when it is removed. Once the lie-the original sin-is removed, and the pain of experiencing the open wound and experiencing our essence, our blood, what we thought of as our truth, flows out and we breath. The space that is revealed and welcomes us home like Dorothy in The Wizard Of Oz, to our original truth, the truth of who we really are. That our power does not come from the splinter did but rather in our awareness, understanding, responsibility and choice of removing it so that we may fully embrace and experience our lives as healed. Knowing a deeper belief in who we inherently are and living from the opening that is now revealed to us. Our real power, our Superhero power. This new awareness and understanding that we are purposely created to be splintered and wounded in our deepest core so that, once removed and healed, with clear eyes wide open, the gift of who we are and the purpose of our lives, revealed, AGAIN. Ironic I know. A mysterious, twisted, confusing but beautiful gift. We have to experience what isn’t the truth so that we can know what it is. Our Superhero power is our understanding of our own splinter, wounding has had on us and live more conscious lives resonating from that open space that no longer houses our pain, the splinter, but is now forever open and flowing with forgiveness, compassion, understanding and the all powerful empathic LOVE.